The daily hordes of tourists have exhausted the Thai beach made famous by the Leonardo DiCaprio movie. Maya Bay, on Phi Phi Leh island in the Andaman Sea, will be closed to all visitors for four months annually starting this June to allow for the recovery of the battered coral reefs and sea life. The decision to keep visitors away was made Wednesday by Thailand's National Parks and Wildlife Department. "It's like someone who has been working for decades and has never stopped," said Thon Thamrongnawasawat, a prominent marine scientist and member of Thailand's national strategy committee on environment development. "Overworked and tired, all the beauty of the beach is gone. We need a timeout for the beach." Many Thai marine national parks are closed from mid-May to mid-October, but because of tourist demand, Maya Bay has remained open year-round since a Hollywood crew set foot there in 1999 to film "The Beach," the dark backpacker tale based on a novel by Alex Garland. The beach receives an average of 200 boats and 4,000 visitors each day. Recent surveys by a team led by marine biologists found a large part of the coral reefs around the area is gone and sea life has virtually disappeared. Other Southeast Asian beach resorts are under threat too. In the Philippines, President Rodrigo Duterte has vowed to close Boracay, a small central island popular for its powdery white sand beaches and vibrant nightlife, saying it has become a "cesspool." "Their waste would go directly to the ocean. The germ content is already very high there," Duterte said last week. "It only looks good because of the white coastline." His top environmental officials say Boracay may be closed in the last week of April after a 30-day notice is issued and the tropical island placed under a state of calamity to allow the government to extend emergency funds to affected villagers and establishments. During the closure, which could last six months or less, a massive cleanup is planned and noncompliant beach resorts and other establishments would have to install waste treatment and disposal systems to halt further contamination. 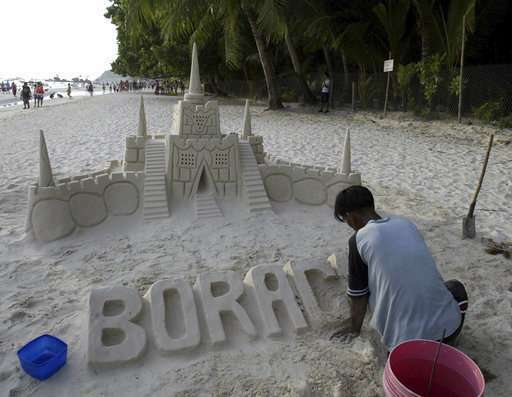 Boracay drew more than 1 million tourists last year mostly from Asia, the United States and Europe. Boracay officials may face administrative cases for allowing environmental laws to be breached for years and for failing to regulate the influx of tourists beyond the island's capacity. Thon said the Thai beach's temporary closing will kick-start the rehabilitation process. "If you ask me if it is too late to save our islands, the answer is no. But if we don't do something today, it will be too late," said Thanya Netithammakum, head of the National Parks and Wildlife Department. When Maya Bay reopens, the department will set a daily limit of 2,000 tourists, while boats will no longer be allowed to anchor there and will have to dock on the opposite side of the island at floating piers. The number of visitors the beach has been seeing is unsustainable, and a temporary closure is better than nothing, Thon said. "The locals know that and we all know that," he said. "This would be a good way to start managing our tourist destinations. And we can improve on what we learn after the first year. We know that it's important we manage our resources well. It's not about more numbers of tourists but about sustainable tourism that benefit locals as well." 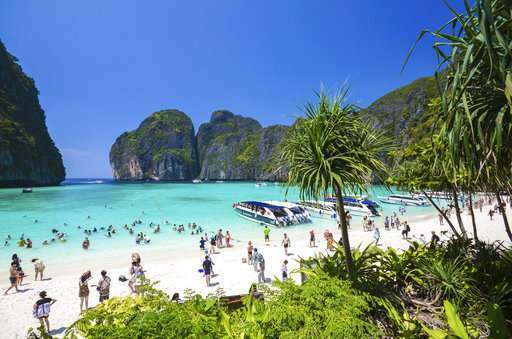 More than 35 million tourists visited Thailand last year, compared to around 10 million when "The Beach" premiered in 2000. Thai authorities have in the past closed off islands ruined by mass tourism. Koh Yoong, part of the Phi Phi island chain, and Koh Tachai, in the Similan Islands National Park, have been off limits to tourists permanently since mid-2016. Thon, who surveyed both islands recently, said the results have been amazing. Areas with a bleak sea life environment and coral bleaching are now teeming with robust and colorful sea life and coral, he said. He's certain that the annual closure will also help restore Maya Bay. "I have always dreamt that one day we could work to bring her back to life. I have been following and working on Maya Bay for more than 30 years. I had seen it when it was a heaven and I see it when it has nothing left. Anything that we can do to bring this paradise back to Thailand is the dream of a marine biologist," he said.